Designed. compiled, edited and constructed by Al Dillette Banner Graphic by MikeTech Updated every Sunday at 2 p.m. While material on this web site can be used freely by other sections of the press, as a courtesy, journalists are asked to attribute the source of their material from this web site. Click here for the law on copyright as it applies to this website. Click on a heading to go to that story; press ctrl+home to return to the top of the page. This site is compiled and edited from various sources and writers by Al Dillette. The views in this column are not those of the Ministry of Foreign Affairs or the Government of The Bahamas. This weekend the 1st and 2nd of June is the 60th anniversary of the Burma Road Riots. 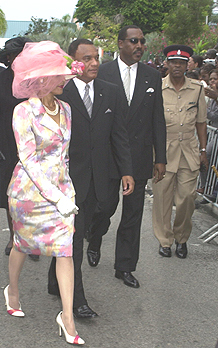 The Burma Road Riots are believed to have been the start of the modern political era in The Bahamas. The riots took place as a result of a labour dispute on pay and conditions on the building of what is now called the Nassau International Airport in 1942. The Burma Road Riots led to significant social and labour law reforms and in tribute to the workers of that day, Labour Day takes place on the first Friday in June. There were many people who are readers of this column who were almost suffering withdrawal symptoms. For those who do not live in The Bahamas, there was some objection in the press of The Bahamas during the week about the continuation of this column. The comments came in the weekly column of Nicki Kelly who is a columnist for The Tribune on Tuesdays. There was also a comment by the Publisher and Editor of The Tribune in its editorial of Tuesday May 2002. The objection of Ms. Kelly is that the name is too closely identified with the Minister of Foreign Affairs the Hon. Fred Mitchell. And its continuation in its present form would cause confusion between the voice of the Government and the individual voice of the Minister. She rejected the disclaimer that appeared on this site last week. We stand by the disclaimer. MS. Kelly’s comments are reported below. In fact the Minister had already taken steps to disengage from the column and has been given a reasonable time to disengage from the site. This was confirmed by the Prime Minister in his statement to the House on Wednesday 28th May. The changes had begun from last week and they continue this week and in the coming weeks. Amongst the changes will be a new name. There will be format changes and there is likely to be advertising. The comment by Ms. Kelly was rational. The comment by The Tribune was not. The Tribune’s editor extrapolated a piece from this website published on 19 May (you may click here for that piece), attributed it to the Minister of Foreign Affairs and then used that piece as a pretext to attack the Minister of Foreign Affairs in a most unseemly manner. The column of The tribune crossed the line of propriety. It is similar to a comment made on this site (you may click here for that comment) when The Tribune sought to defend a bad and inappropriate decision by them to publish a naked man, with pubic hairs showing in its advertising pages. They sought to put it on the high plain of freedom of speech. In fact it was a pure prurient, commercial decision. The Tribune in the case of the editorial, bits of which we publish this week made a personal attack on the Minster of Foreign Affairs in matters that were inappropriate for a mainstream paper, and more appropriate to The Punch. It is again a troubling episode in their history when it appears that anything will be done for a political motive no matter how irrational and inappropriate. Anything will be done for money, once The Tribune is enriched and its political agenda enhanced. There is a similar story with the inappropriate music that they play on their station 100JAMZ. While they deplore the lessening standards on the one hand, their radio station helps to subvert the morals of society by exposing young children to inappropriate music. We hope that you like the changes coming in the site. We have our own ideas about the changes in the name that is coming. Give us your suggestions about a name change. When the name changes, there will be a transition period when you will be able to get the site with the old name. This site is not a place for Fred Mitchell to vent his spleen. 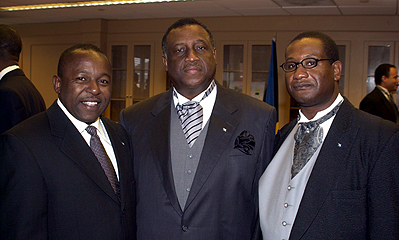 This is a news and commentary site on issues relating to the public affairs of The Bahamas. Mr. Mitchell was its main writer. That position has changed since he took office and ceased last week. One wonders if the objections of The Tribune are not just related to competition, since their concern is often how much will it bring to the bottom line. But we are sensitive to public criticism and will make the necessary adjustments, as we should. This week on the site for the week ending Saturday 1 June at midnight there were 42,316 hits. For the month of May that ended on Friday 31st May, there were 232,647 hits on this site, a banner moth unprecedented in our history and thanks in part, no doubt, to this week’s press coverage. The total for the year to the 31st May is 1,485,826 hits. We hope you have enjoyed the site. For a photo essay on the funeral of Archdeacon William Thompson. Click here. Tennyson Wells is the Member of Parliament for Bamboo Town, elected as an Independent. The former Minister under the Free National Movement is now in fine form. He rose to his feet during the early session of the present Parliament to give advice to the Leader of the Opposition Alvin Smith. Mr. Smith was a surprise choice as Leader of the Opposition, given the fact that there are two former Cabinet ministers in the House on the FNM side: Brent Symonette and Kenneth Russell. Mr. Smith was given a bit of advice by Mr. Wells. He reminded Mr. Smith that he was the Leader of the Opposition under article 82 of the Constitution. He told Mr. Smith that once he had that post, no one could do him anything and that he ought to exercise his choices in his own deliberate judgement. He told Mr. Smith that no one should be able to tell him what to do. “Do not let anyone tell you what to do,” Mr. Wells said. 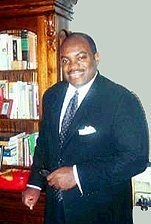 It is believed that Mr. Wells was referring to the report in the press that when Senators were appointed by the Leader of the Opposition for the FNM, this was done so after consultation with now senator Tommy Turnquest who is the Leader of the Free National Movement but who himself was not elected to the House. Mr. Turnquest is now Leader of the FNM in the Senate. The House was moved to laughter by Mr. Wells' tongue in cheek address. Pierre Dupuch, the Independent Member of Parliament for St. Margaret was furious. Former Prime Minister Hubert Ingraham, now the plain and ordinary Member of Parliament for North Abaco, showed up on Wednesday 29 May to be sworn in as a Member of Parliament. The House was in the middle of its agenda, and the point on the agenda for swearing in of new members is item number one. Having passed that point on the agenda, it required the unanimous consent of the House in order to facilitate the swearing in of Mr. Ingraham. Mr. Ingraham is said to have gone on a trip to Canada to attend the graduation of his daughter and therefore could not attend on the first official day of the opening of Parliament. Several person have expressed scepticism about this because they argued that he set the election date and the date for the opening of Parliament and should therefore have known not to be away when Parliament was opening. Mr. Dupuch said that if it took his consent to allow Mr. Ingraham to be sworn in, he would withhold it. And so he did. The result was that Mr. Ingraham had to cool his heels and wait until Thursday 30th May to be sworn in. Oswald Ingraham, the Speaker of the House and Member of Parliament for South Eleuthera, made his first working day communication as Speaker of the House. In it he reminded Members of the House that there is a dress code. He said that until the rules of the House change, Members of the House are expected to conform to the rule that requires dark clothing for the House session. The Speaker was no doubt concerned about the proliferation of bright ties and bright suits worn by members. This move is to be applauded. In the old days, the House used to meet in the evenings and members were required to wear evening formal dress. Now the requirement is a lounge suit that is dark in colour with a conservative tie – not flowers, golds and yellows, no brown suits. Photo of MPs dressed for Opening of Parliament, from left Keod Smith, Hon. Neville Wisdom and Sidney Stubbs, by Peter Ramsay. “Fred Mitchell is an enigma – and in our view, not a very attractive enigma. “In his political wilderness years when he was willing to grasp at any straw that might land him on the moon of his dreams – the Prime Minister’s office – The Tribune was the eighth wonder of the world. “He desperately needed the columns of The Tribune during those years. He never missed an opportunity to have an opinion for publication on something or other, no mater how insignificant. “Other politicians complained that Mr. Mitchell was hogging The Tribune’s columns – everywhere one looked, there was nothing but Fred Mitchell. What they failed to realize was that while they slept, Mr. Mitchell, so obsessed with his objective, was busily burrowing away on his tunnel to the Prime Minister’s office. He needed some outlet to let the public know who he was. And so to him, every newsworthy subject was worth a Fred Mitchell commentary. “Remember just a few weeks ago you almost had to take a stick to keep him from our doors with his news releases, now he's disappeared”. The Minister of Finance Perry Christie presented his first budget communication to the House of Assembly on Wednesday 29 May. Mr. Christie predicted a deficit budget and said that revenue projections were not positive. He said that the budget was the FNM's budget since the timing of the General Election did not permit the PLP sufficient time to deal with the budget and its priorities. He praised Senator James Smith, the Minister of State in the Ministry of Finance for his work on the budget. He predicted that he would be returning to the House later in the year with a supplementary budget and with properly considered revenue measures. The Prime Minister has announced that Sir Sidney Poitier has been invited to remain as The Bahamas Ambassador to Japan and also to take over the added ambassadorship for Culture at the United Nations Educational, Scientific & Cultural Organization (UNESCO). Mr. Christie said that he was reviewing all other diplomatic appointments and he asked all others to stay on until he has made further decisions. This also applies to all Government Boards. The Prime Minister said he expects to complete the review of Government Boards by 30th June. Mr. Christie explained that this was part of a new culture and that he expected no board members to take any precipitous action. Minister of Works Bradley Roberts, speaking in the House of Assembly has accused the former Prime Minister Hubert Ingraham of having "corrupt intentions" and Mr. Roberts laid out a case against Mr. Ingraham to support the allegations. Please click here for Mr. Roberts speech in the House of Assembly. Minister of Foreign Affairs Fred Mitchell made his maiden address in the House of Assembly on Monday 27th May. In it he discussed the situation in Fox Hill, the Ministry of the Public Service and the Ministry of Foreign Affairs. He said that the Government has already done the technical work for the establishment of a consulate in Cuba and that a national dialogue will be initiated on the subject within the coming months through a Select Committee of the House and of the Senate. Minister of Foreign Affairs Fred Mitchell in his intervention during the debate thanking the Governor General for the delivering of the speech from the throne said that he hoped that part of his legacy in the Fox Hill constituency would be to turn the tide of the drop out males in The Bahamas to form normal productive social lives. He used the fact that the ratio of men to women in prison in the approximate age group of 17-30 was hugely weighted toward men and the exact opposite was the case in the same age group at the College of The Bahamas where women outnumber men almost three to one. Clearly, most men commit the crimes, and there is a clear case of dysfunction amongst young men. The World Health Organization has published a piece called ‘Boys In the Picture’. It is an argument for the development of an adolescent health programme. The Bahamas has such a programme within its Ministry of Health. The unit is not well known but does substantial and good work. One of its employees is Vincent Roberts, the brother of artist Antonius Roberts. The Minister said that he plans to ask the unit to assist in the development of a pilot project in Fox Hill to assist in turning the tide of young male dysfunction in the Fox Hill area. A meeting of community leaders is planned to allow the programme to get started in the summer time. You may click here for the full address. Allyson Maynard Gibson, the Minister of Financial Services and Investment is heading a Bahamian delegation to the XXXII General Assembly of the Organization of American States in Bridgetown, Barbados. She is accompanied by Attorney General and Minister of Education Alfred Sears and Bahamian Ambassador to Washington Joshua Sears. The General Assembly takes place against the expectation that countries will signal a convention against terrorism. The OAS is made up of all independent countries of the region from North and South America and the Caribbean. The conference is from 1st June to 4th June. U.S. Secretary of State Colin Powell is expected to attend. A Bahamian student abroad was interested in the story that we published last week about the fashion parade at the state opening of Parliament on Wednesday 22nd May. The ladies were a big hit and all the hat shops sold out. We republish the photo of Mrs. Bernadette Christie this week because the photo did not appear until the late edition of the column last week and many persons did not see it. We also publish other photos by Peter Ramsay that show the fashion parade of both men and women. We hope you enjoy. We republish the photo of Peter Ramsay and the story from last week’s report on the new red bags for Members of the Cabinet. With the Minister of Foreign Affairs the Hon. Fred Mitchell and Marcian Cooper, a senior staff member at the Ministry of Tourism. We republish the photo because it was part of last week’s late edition and some of the early readers of the site did not see it. 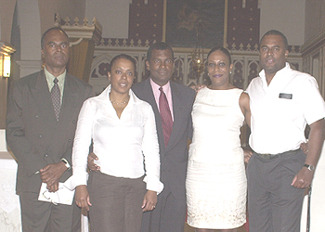 We also republish the photo of the Mitchell siblings by Peter Ramsay when they appeared at the church service for their late parents Fred Sr. and Lilla Mitchell. The service took place at St. Agnes Anglican Church on Tuesday 21st May. The Mitchell parents died on 23rd May 2001 and 4th May 1999 respectively. The service was conducted by Reverend Fathers Patrick Johnson, Rector of St. Agnes, Curates Rodney Burrows and Roderick Bain and James Moultrie, Rector of Holy Spirit. This photo appeared in last week’s late edition and is republished for those who may not have seen it. 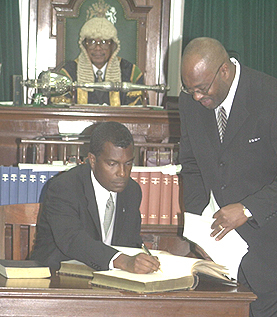 We publish this week a photo of the new Minister of Foreign Affairs and Member of Parliament for Fox Hill Fred Mitchell on the eve of his public work in the first month of the new Parliament. We wish him well. 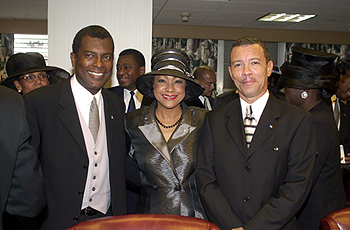 The photo is by Peter Ramsay from left, Minister Mitchell, Senator Cyprianna McWeeney and former Attorney General Sean McWeeney..
Earvin 'Magic' Johnson visited The Bahamas during the week looking for investment opportunities. 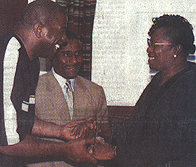 The Tribune showed a photo of him greeting Cynthia ‘Mother’ Pratt, the Deputy Prime Minister. 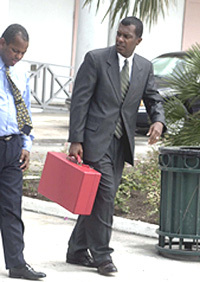 The United States President George Bush has announced that under U.S. Law Samuel 'Ninety' Knowles who is awaiting the outcome of an extradition hearing in The Bahamas by the United States is to be cut off from access to the U.S. financial system and business with U.S. companies. This is called sanctioning. It appears that this is possible even though Mr. Knowles has not been convicted of anything in the United States. Meanwhile U.S. Ambassador Richard Blankenship appearing on the ZNS talk show ‘Immediate Response’ in Nassau was quoted by The Tribune of Saturday 1 June 2002 as saying that there will be no repercussions for The Bahamas if Mr. Knowles is not extradited to the United States. He was quoted by The Tribune as saying: "We would be very disappointed. We would be very disappointed. We think that Mr. Knowles has committed some very serious crimes not only against the people in the United States, or we wouldn't have indicted him." The popular basketball coach Anthony Swaby is said to be clinging to life in a Florida hospital following a serious road traffic accident in Miami on Thursday 30th May. His mother Joyce was killed instantly in the same accident. A rented van that the Swabys were driving was hit by a reportedly speeding Florida Power and Light van. We wish the family well in this time of trouble. Guardian photo. Leona Henderson, a well-known Bahamian handicraft lady, married to Kendal 'Panther' Gibson of Junkanoo fame, has died in a Miami traffic accident, according to reports. Initial reports say Ms. Henderson was travelling along the Miami airport road Sunday 2 June when a traffic accident occurred and she died. She was reportedly in Florida for the Coconut Grove Festival, a favourite of Bahamians, being held there this weekend. She was particularly well known in handicraft circles as a forward thinking Bahamian woman entrepreneur and had recently been appointed to a Government board to deal with these issues. Her husband, 'Panther' is also well known; in Junkanoo circles particularly for his work in the adult individual costume category. Despite public criticism over its implementation and the unpopularity of the law, the new seat belt law is in effect in The Bahamas as of 1st June. When the law was debated in the Parliament the then Opposition PLP opposed certain of its provisions in particular the requirement for passengers in the back seats to buckle up; the level of fines and the fact that the driver of the car could be fined for the refusal of adult passengers in the car to buckle up. The Permanent Secretary to the Ministry of Transport says that the matter is still being reviewed. Fred Mitchell, the Minister of Foreign Affairs, has left The Bahamas for the Mayo Clinic at Rochester, Minnesota for his annual physical. This article by the former Beirut hostage Terry Waite on the Guantanamo prisoners was published on the website http://www.counterpunch.org in January of this year and we republish it here. Mr. Waite is the former special envoy to the Archbishop of Canterbury. He was held captive by terrorists in Beirut from 1987 to 1991. I can recognise the conditions that prisoners are being kept in at the US camp at Guantanamo Bay because I have been there. Not to Cuba's Camp X-Ray, but to the darkened cell in Beirut that I occupied for five years. I was chained to a wall by my hands and feet; beaten on the soles of my feet with cable; denied all my human rights, and contact with my family for five years, and given no access to the outside world. Because I was kept in very similar conditions, I am appalled at the way we - countries that call ourselves civilised - are treating these captives. Is this justice or revenge? I was determined that my five years in captivity would not break me, and they didn't. But I cannot say that it was easy. The hardest thing for a prisoner in those conditions is the uncertainty. You don't know what will happen to you next: you have no rights, no one to speak to, no one to advise you, no one to fall back on. You only have your own resources. These men, who may or may not be guilty, will be experiencing that sense of isolation and dislocation. For four years I was kept in solitary confinement and had no companionship at all. I was always blindfolded, or had to wear a blindfold when someone came into the room. I never saw another human being. The initial effect is eerie, but eventually you become accustomed to it. You learn to live from within. But that's tough, and no one should be forced to attempt it. I had a diet very similar to that being given to these men - bread, cream cheese, rice, beans. I was adequately fed, but not luxuriously, and I lost a lot of weight. The greatest difficulty was never having any exercise in the whole period. I had to get what exercise I could while chained to the wall. I had five minutes a day to go to the bathroom; for the rest of the time I had to use a bottle. The conditions were inhuman, but all the time I had to assert my humanity. What I experienced makes me all the more determined when I say that prisoners of whatever description must be treated humanely and justly. I would stand up for the rights of the alleged terrorist and of any other individual facing serious charges. I am not soft on terrorism - I have had too many dealings with it to be so - but I am passionate that we must observe standards of justice. I fear that unless firm action is taken to institute just and fair procedures, the long-term results for the US will be catastrophic. Terrorism is not ultimately defeated by the force of arms; you have to deal with the root causes and ask what makes people act in such extreme ways. It alarms me greatly that the prisoners' status seems to have been determined almost exclusively by the US president and his advisers. Their status should be determined by an independent tribunal. The US seems to be making up the rules as it goes along. First, it said that the appalling acts of terrorism in New York and Washington were acts of war; now it is saying that these captives are not in fact prisoners of war, that they are unlawful combatants. An independent tribunal should establish precisely what they are. If the US is making up the rules, it will have no moral authority should other countries try, convict and perhaps execute American and European suspects. There will be no moral grounds on which we can stand if we allow this to continue. Americans tell me that they have little patience with international tribunals - they take a long time, and often come up with a different result from that which was hoped. But that is no argument. It doesn't matter how long it takes - justice must be seen to be done, and be done impartially. I was appalled when I heard a prominent American suggest that in certain circumstances the limited use of torture might be justified. That is a dreadful statement to come from a civilised nation. Torture can never be justified, and must be clearly condemned. When it comes to trial, these men are entitled to basic defence rights and ought to be tried under the auspices of the UN. It is vital that we uphold standards of international law for the protection of the innocent, and for the protection of American or European subjects who may find themselves in difficult circumstances in the future. For once, morality and pragmatism go hand in hand. FNM Readies For Local Government Elections - Notwithstanding a public address by the Minister for Local Government in which he spoke of the need to keep party politics out of local government, each and every branch of the Free National Movement on Grand Bahama met this past week to ratify candidates for this month’s local government elections. Shame on them. They now leave the PLP very little choice but to press its advantage from the recent General Election and follow suit. But where does it end? We hope that the politicization of the process does not prevent the best candidates from each area giving service to their communities. ‘Our’ Lucaya Signs Contract - Among the minor miracles wrought by the recent PLP victory at the polls is undoubtedly the signing of a long awaited industrial agreement governing workers at ‘Our’ Lucaya hotel in Freeport. Press reports seem to indicate that the Anglo-Chinese Hutchison Group, which owns the hotels and the Grand Bahama Harbour, has decided on a conciliatory approach. Resorts Remains Unrepentant - Meanwhile, management at the former Resorts at Bahamia, the former Princess Hotels, now renamed Royal Oasis, appears to remain unrepentant on the labour front. Recently, this group advertised in the local newspapers for a Director of Activities when sources report that the person they intend for the post was already on the island. Inside informants tell News From Grand Bahama that a Royal Oasis executive, known among Bahamians as ‘The Knife’ was preparing to apply for further work permits in hands-on restaurant management. Heard On The Street - Moans from several big FNM contractors, complaining about “millions of dollars in sweet deals” gone down because of the change in Government. Major Power Boat Race For GB? - Tourism sources say that plans are in the works for a major new power boat race to come to Grand Bahama, reminiscent of the ‘Bahamas 500’ of the 1960s. There is talk of prize money in six figures and stopover visitors in the thousands with resulting revenues of millions. What a great idea. Grand Bahama / Abaco Bridge Revisited - The change of Government has prompted talk of revisiting the idea of The Bahamas as a nation of bridges, with the first major inter-island bridge being constructed between Grand Bahama and Abaco. Supporters say the project would bring benefits far beyond its immediate horizons. Tennyson Wells Canvassing? - Former FNM Cabinet Minister now Independent MP Tennyson Wells was in Grand Bahama last week, apparently canvassing supporters who remain inside the FNM about another try at the party’s leadership. Wells is said to have considerable support in Grand Bahama, but there is a faction whose spokesman told News From Grand Bahama “We would rather lose again than to make Tennyson our leader”. Things that make you go hmmm! British High Commissioner & FTAA - The British High Commissioner to The Bahamas Peter Heigl visited Grand Bahama this past week and stopped to speak to the Chamber of Commerce. He espoused the view that the upcoming trade agreement of the Americas FTAA is good for world commerce. Local attorney and former Grand Bahama Chamber president Rawle Maynard was among the questioners who wondered exactly how FTAA would benefit The Bahamas and the Caribbean if our areas have only cheap labour and cheap raw materials to offer. 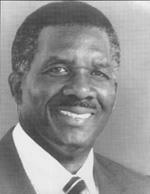 The Ingraham Legacy - Many informal discussion in Grand Bahama turned their attention this past week to thoughts of the enduring legacy (if any) of the former Prime Minister Hubert Ingraham. The impressionistic results seem to be that Mr. Ingraham will go down as a prime minister who favoured the foreign over the Bahamian in people and solutions to problems. One example constantly cited was the observation in the House of Assembly of Minister Shane Gibson who noted that BaTelCo was fully Bahamianized before Mr. Ingraham’s government. Now, foreign workers dominate the upper reaches of that corporation’s financial structure. Support For Website - News From Grand Bahama has been deluged by people with varying opinions on the future of this website. While we have had some of the variety “You’all should carry your … you’re finished!” The vast majority we happily report insist that we continue despite our former chief writer’s ascendancy to the Cabinet. Rest assured. The bench on this site is deep. We shall continue. Until next week then, and thanks for reading. EDITORIAL NOTE: WE HAVE TWO EDITIONS OF THIS SITE ON SUNDAYS. THE EDITORIAL CONTENT WILL NOT USUALLY DIFFER MATERIALLY. THE FIRST EDITION WILL BE AVAILABLE ON OR ABOUT 2 P.M. ON SUNDAYS AS USUAL. A LATE EDITION WILL BE UPDATED AT 7 P.M. ON SUNDAYS IF NECESSARY. ALL TIMES ARE EASTERN DAYLIGHT TIME. THIS SHOULD GIVE US A CHANCE TO CORRECT ANY ERRORS OR SOLVE ANY TECHNICAL PROBLEMS. SO CHECK BOTH EDITIONS. THANK YOU. A small red star will be placed next to the headlines of any stories added after the initial upload.